Cabin with Knotty Pine very remote six acres deer coming on the lawn it also has a deck with a barbecue and a table to eat breakfast or dinner on, it's only 10 minutes to town and 25 minutes to the Southgate to Yosemite National Park.The kitchen has everything you need spices and oils and everything to cook and BBQ, use of the laundry room. The front room has a large couch to enjoy a nice view or watch some dvds.This cabin has a nice cozy feel with a small desk and a table to place games on.There is plenty of open space to enjoy outside.Air conditioning to help with summer heat you will feel at home here. Two separate bedrooms with comfortable mattresses with A/C for those hot nights.And plenty of room for your items. You can enjoy breakfast out side on the grass with the morning sun, then enjoy dinner with a sunset out on a covered deck. I have worked in Yosemite for 38 yrs and love to share the beauty of the park.I have been renting this cabin for two seasons and enjoy peoples excitement of coming here. I live two minutes for this property so I can help with anything you might need. 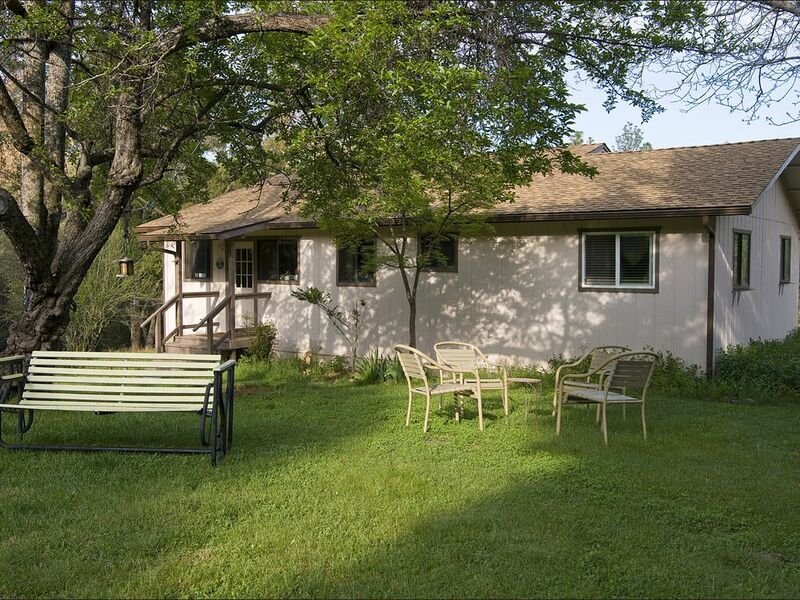 This cabin is in the town of Oakhurst which is closest town to the park.So you can enjoy all the amenities of our town and still be close to the park. Once you arrive at this cabin you feel like you are on vacation with your own place to relax.You have open space around you and should see some wildlife pass through. And Bass Lake is very close to enjoy dining out very nice big lake. And Oakhurst is close to the Mariposa Grove of the big trees which is opening up June 15th 2018.Also close to the turn off to Glacier Point a Yosemite must! Plenty of space to park and feel safe. Should have everything you need,always checking and replacing with needed items. Everything you need to cook with and we provide many spice options. Also tea and coffee and small on the go food. Our stay with three people was very peaceful at Bob and Diane's place. A quiet place with all the amenities that we needed for our trip to Yosemite. I would use this arrangement again. An added bonus was a beautiful sunset over the valley during our stay.